I’m so excited to share Lily’s nursery with you all! I honestly don’t think there has been a bedroom in our house that has anywhere near the amount of planning, attention to detail and money poured into it like this one! Out of all the baby girl nursery themes out there, I can unbiasedly say this is my favorite. 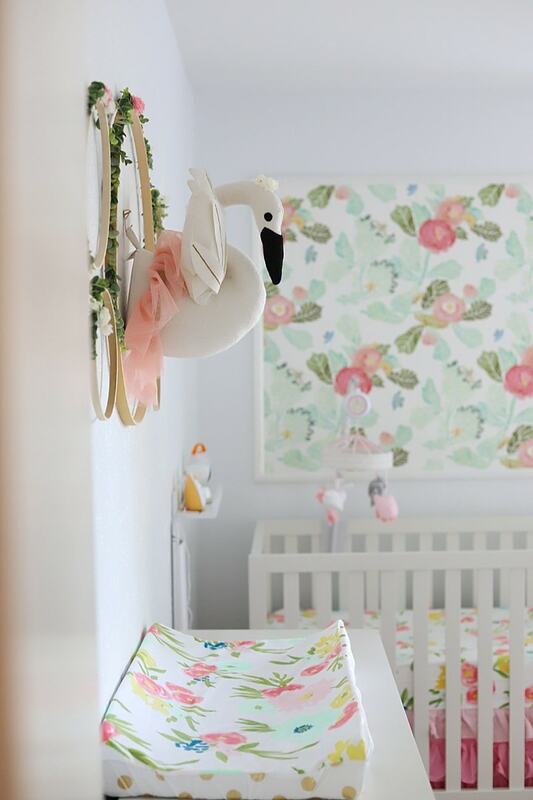 🙂 This is truly a room that love built filled with new furniture from our parents, gifts from friends and a lot of handmade goodness including nursery wall decor and a gorgeous floral nursery wallpaper! When I first saw those two pink lines pop up on my pregnancy test, I had a million emotions immediately shoot through me. We were standing in the remnants of our kitchen, having just ripped the entire thing out literally the day before after months of debating should we or shouldn’t we remodel (haha.). After gathering my thoughts together, I did what any remodeling mama would do…get the heck out of the dusty construction zone! 😛 We drove to a book store and I picked up books on pregnancy, parenting annnnd—a magazine filled with girl nursery ideas! Long story short, that magazine was an accidental purchase because I was convinced we were having a boy —I was so much calmer than usual during pregnancy (my friends swore it was testosterone!). 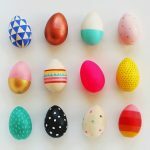 I had Pinterest boards filled with boy nursery ideas…and one tiny baby girl nursery themes Pinterest board I threw a few pins onto here and there. 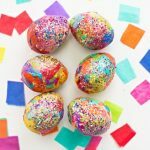 Imagine my surprise (and joy!) when we found out we were having a GIRL! This post contains affiliate links at no extra charge to you. I had the name Lily picked out for years, and as soon as we knew she was a girl, it was a done deal. 🙂 When it came to baby girl nursery themes I landed on a floral theme, inspired by her name. It was meant to be! I decided to fill the nursery with neutral furniture, but have fun and go extra girly with the decor—pink and flowers everywhere, please! 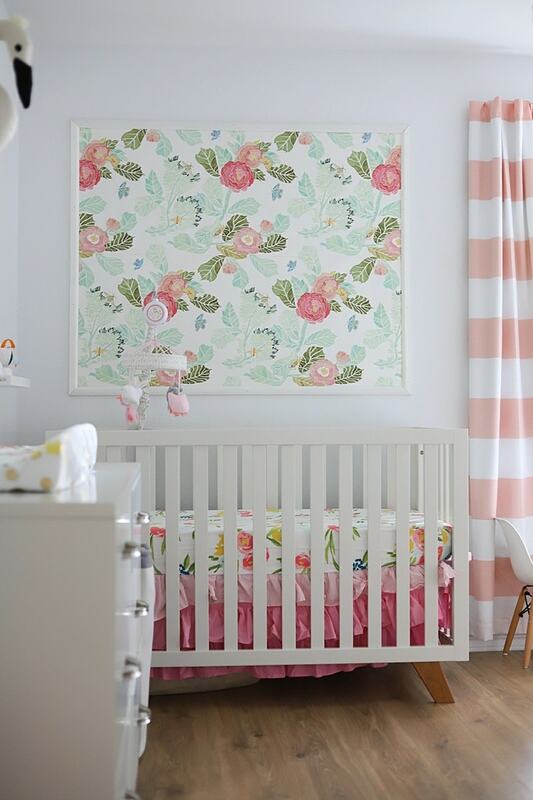 Of course, the trick was creating a floral nursery that didn’t seem dated or frilly. Here is the quick list of items used in Lily’s floral nursery, but I expand a bit more on some below for more information. Nursery ceiling light– sadly, I can’t find the exact one we have, but this nursery ceiling light or this nursery ceiling light are both somewhat similar. 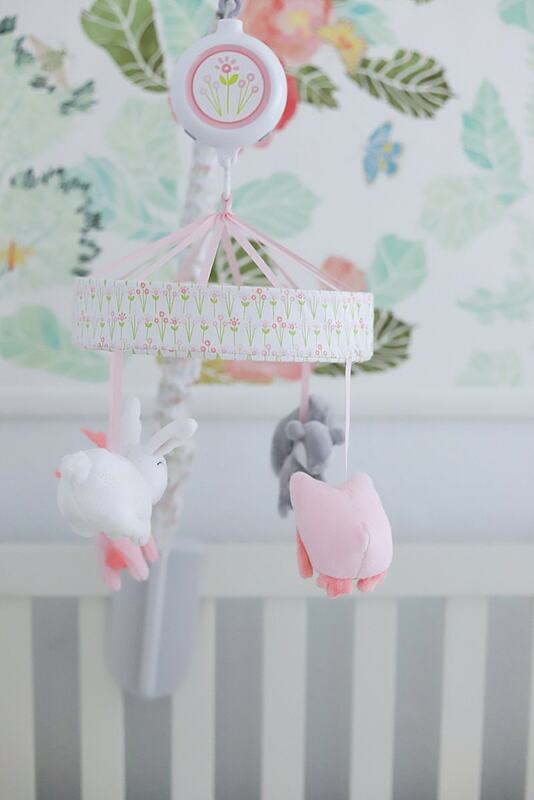 If you’re looking for other girl nursery ideas I also like this pink nursery ceiling light as well. Here are two other similar crib bedskirts to consider from Amazon if that’s easier (free 2-day shipping FTW) >> pink ruffle crib bedskirt & tiered pink crib skirt with ruffles. If you prefer not to get the nursery bedding set, you could buy the individual pieces like the floral receiving blankets (trust me, these are so cute and come in handy for everything! ), reversible floral baby blanket and the floral fitted crib sheet. 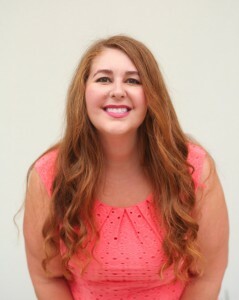 Whichever baby girl nursery bedding you get, you’ll want to make sure you definitely get 2-3 different kinds of fitted sheets MINIMUM (if you haven’t heard, babes are messy little things and you don’t want to be scrubbing off bodily fluid at 3 am with no other options). If you are going with the floral baby girl nursery theme, here are a few more crib sheets to look at >> blush, gray and white floral crib sheet, pink peony crib sheet and floral 100% cotton crib sheet. One of the things I get the most compliments about in Lily’s room is the floral wallpaper in the nursery (the other is the crib bedskirt!). 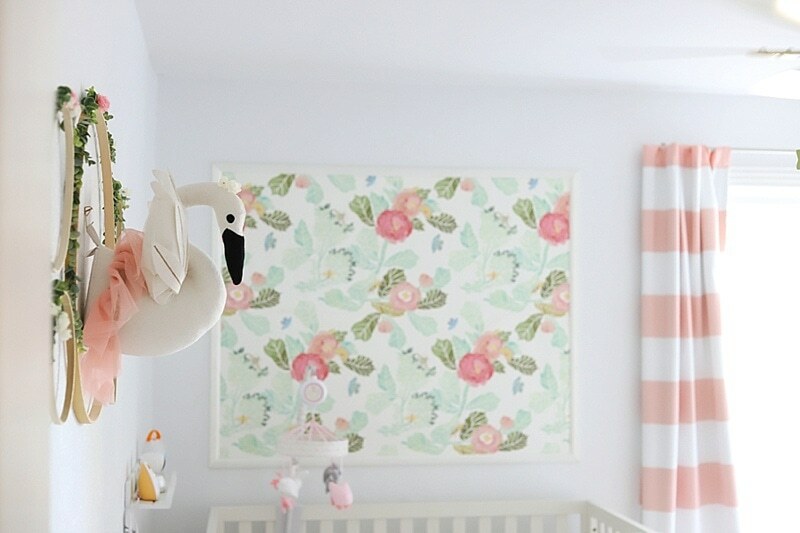 If you are looking for a fun way to add a splash of color and personality, nursery wallpaper is the way to go. Butttt, if you are like me and want all that but also want nursery wall decor that is also low commitment (i.e. 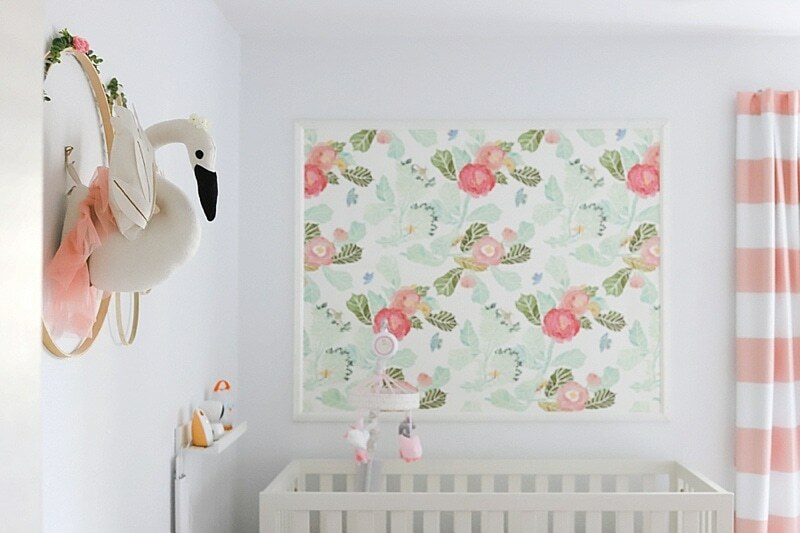 no pasting anything to your wall), then you have to try my easy DIY framed nursery wallpaper project. 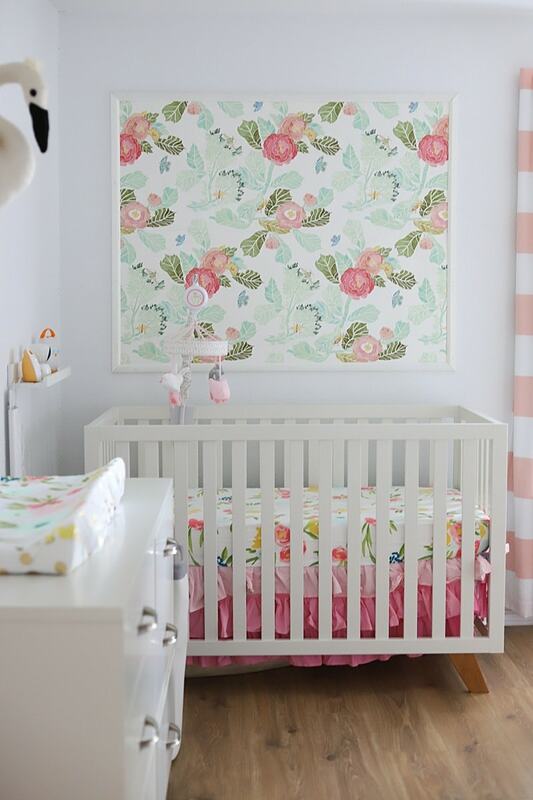 However you get it on your wall, this floral wallpaper in the nursery is my absolute favorite and one of the sweetest girl nursery ideas out there. You can get it here >> girls nursery wallpaper. In all honesty, the options for girl nursery wall decor are endless. However, once I decided I wanted to do a floral themed nursery, I had to figure out a way to incorporate flowers into her room as wall decor without it looking grandma-esque. A lot of people use shelves with cute decor and framed pictures on it above the dresser, but I was a little paranoid about a shelf hanging above her changing table—what if it somehow fell down on her? Without a shelf, a lot of the nursery wall decor ideas I had were out. Thankfully, I finally figured it out! 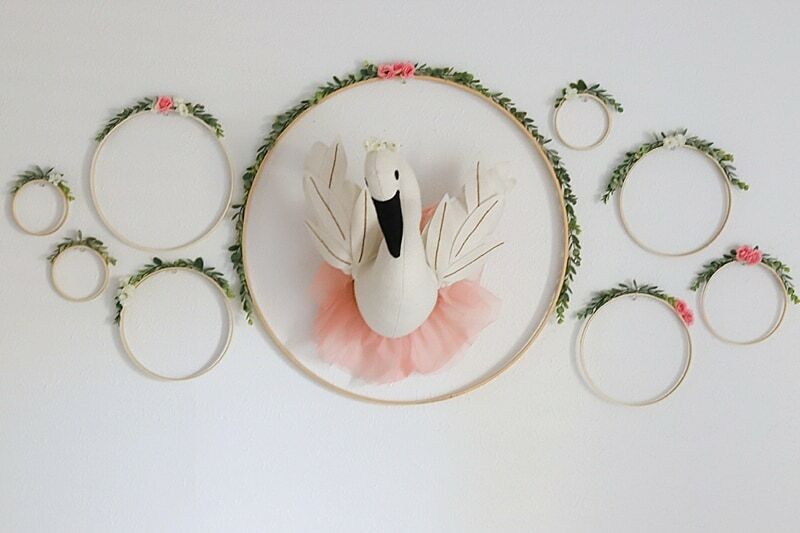 I started with this cute stuffed swan head (there is a ton of other cute animals too!). I really wanted something fun on the wall around lady swan because there was so much white space left. After a few months (like SIX, literally) I finally figured out what I wanted to do after several failed attempts. I made these cute DIY floral hoop wreaths with lots of greenery—I have a post coming soon with all the details! 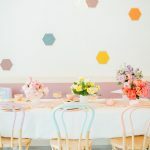 Hang lightweight foam flowers (this is what I was going to do for her nursery wall decor, but I loved the idea so much I stole it and put it in our living room >> easy DIY flower wall). Whatever you decide to do, I absolutely recommend having some sort of interesting nursery wall decor right above the changing table—it has been a lifesaver for me to have something to point to and have her pay attention to! Trust me, when your baby hits six months or so, that’s when all the sh*t starts to hit the fan—maybe even literally. Have a distraction! Last, but definitely not least is blackout curtains! If no one has told you yet….make sure you get BLACKOUT curtains! The last thing you want is to finally lay your sleeping baby girl down and have sunlight wake her up. So, that’s it! 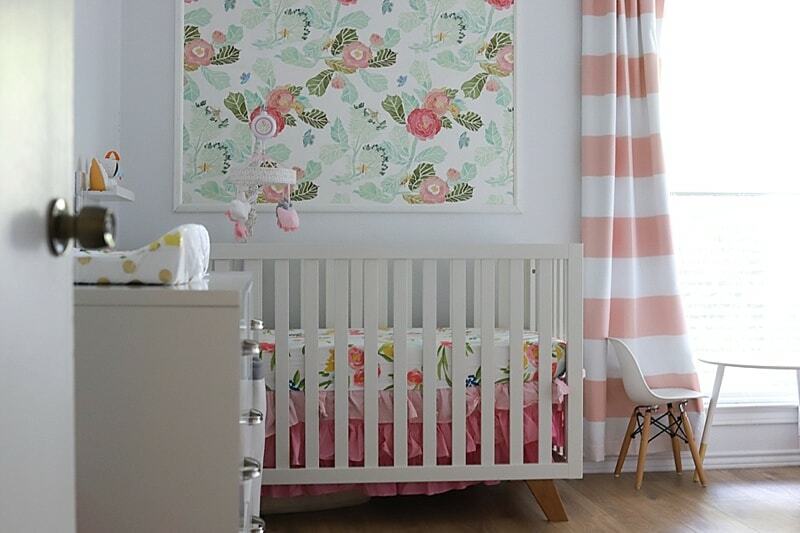 Our baby girl nursery with a flower theme—appropriate for a baby girl named Lily, right? 🙂 Her room is one of my favorite spaces in our home—so fun to see her loving it too! What are your favorite nursery ideas?